Want a fast food option without the cost, or the grease? Why not make it at home? These are a delicious way to start the day and you can vary the ingredients to suit your taste. I love these on a Saturday or make them for a special holiday breakfast. You can serve them with hashbrowns and fruit, or for dinner I add a salad. Yum! Poach your eggs. Now, if you've never poached eggs, don't worry about it. It's not really that hard. Check out this video for directions. One thing they don't mention is that if your egg sticks to the bottom of the pot, you can use a spatula to gently dislodge it. You can also poach more than one egg at a time, so don't think you have to stand by your stove forever, waiting for eggs. In the meantime, split and butter the English muffins. Turn your oven onto broil and toast them until they are nicely browned. Top 1/2 of the English muffins with a slice of cheese, and the other half with some ham, bacon, or turkey. Put back under the broiler until the cheese melts and is bubbling. Remove from oven and plate them-one piece with cheese, one with ham, and then top the ham side with the egg. Here's a trick I've learned-if the yolk of your egg is soft, you'll bite into it and yolk will squirt everywhere. 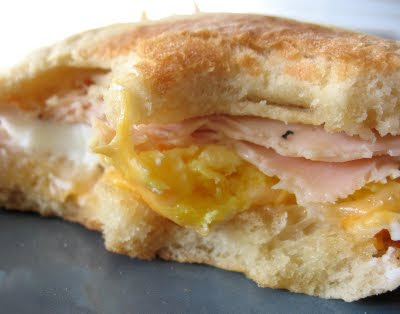 Before sandwiching the whole thing together, I often get a fork and mush up the yolk a bit so that the liquidy yolk just runs inside the sandwich and makes it all delicious.